I absolutely love seasonal candies. When it comes to Easter, it’s so dang hard to resist my favorite candies in pastels. It just makes them that much cuter. This doesn’t bode well for my thighs, since I’ve probably consumed about 45902 Cadbury caramel eggs this season alone. 😛 When I was walking down the candy aisle earlier this week, I thought about baking with Easter candy just so I could have yet another excuse to buy another bag of candy. Then it hit me when I saw the Peeps: S’mores. I know I’ve seen s’mores cookies on a few food blogs before, so I grabbed a bag of Sixlets and Peeps (as well as another box of Cadbury caramel eggs…ugh). Preheat the oven to 375 degrees. In a medium bowl, whisk together the flour, graham cracker crumbs, baking soda and salt, until well blended. In another bowl, using a mixer, beat the butter for about 2 minutes, until light and fluffy. Add the sugars and beat for about another minute. With the mixer on low, add the vanilla extract and the eggs, one at a time, scraping the bowl after each addition. Add in the flour mixture slowly, and mix on low until just combined. Fold in the rainbow chips with a spatula. Using a small cookie scoop (appx. tbsp. sized), scoop the cookie dough out, giving about 2 inches between each cookie (like I said, these do spread). Bake for about 7 minutes and take the cookies out of the oven. 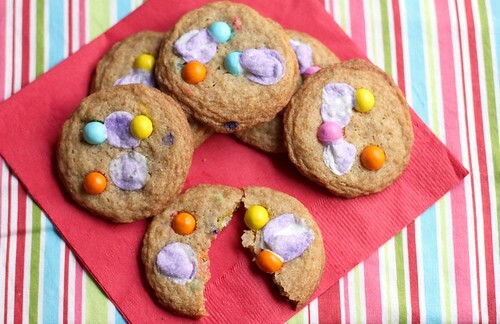 Immediately add the sixlets and peeps, by pressing them gently into the cookie. Place the cookies back in the oven and bake them for another 3-4 minutes. Allow the cookies to cool on a cooling rack, and serve! I love seasonal candies too…I usually just eat them all though! 🙂 These look so good! !